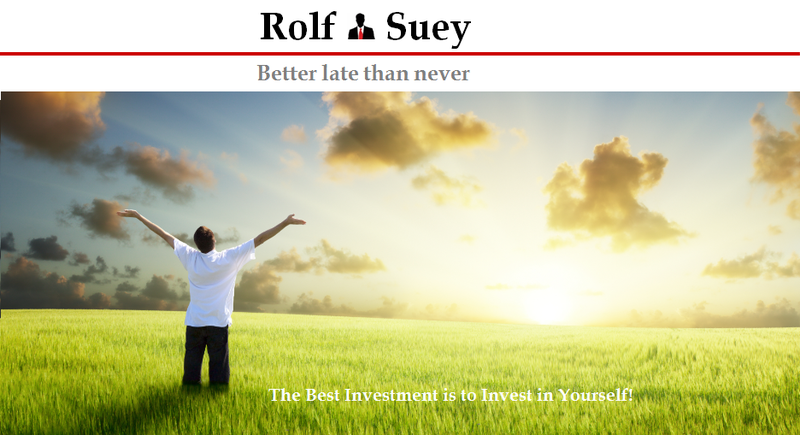 Rolf Suey - Better Late Than Never: My Major Stock Portfolio Selloffs in 2015 - I use more "Gut" than "Logic"! Last year, I did two major sell-off from my portfolio. Eventually I ended up with as much as 75% cash from my stock-bond-cash-portfolio at one point and continue to hold more than 60% cash up to end of last year. The first sell-off was just before 22 Aug 2015 when somehow I do not feel good after the China July first stock market crash. I blogged about it. Refer here. The second major sell-off was right after I visited a respected elder "my ex-boss" for the sake of presenting to him a small gift and a card to tell him how much I am grateful to him. For without him, I will not have what I have today both in wealth and more importantly the much improved wisdom in life. In return, he handed me a book to read - "The Harbinger"! I also blogged about it. Refer here. After reading the book, I feel uneasy about the stock market. Each night I will crazily spend hours reading online and listening on youtube to those experienced investors what they feel about the market going forward. Who are the so-called experienced investors I followed? After researching and going through many filters, the experienced investors to me, are Ray Dalio, George Soros, Robert Shiller, Jim Rogers, Carl Icahn, Marc Faber and Peter Schiff. And why am I so damn sure that they will be right? I am not sure! What I am sure was back then I somehow feel very strongly connected to these people! Their eyes and "body language" somehow tell me more things than the words they speak! They somehow reveal to me that they telling the truth for reasons not just with the aim of solely to create more wealth for themselves or to prove to this world that they are right, BUT all I feel is their need to speak the truth! And nothing but the truth for the greater good of people! Hmm.... Robert Kiyosaki also speak about the crash in 2016, but he somehow did not give me the same feeling as those I mentioned earlier. Today I am grateful that I am blessed with a good position of cash to take advantage of the situation. Maybe sometimes it's better to use your "Gut" than Logic! For those who is a faithful religious believer, he will say this is God's Blessing for the belief in him! For a non-believer, maybe... "Heng Ah...."
I also have a method. If roads ahead that I am really-really-really unsure, I prefer to be more paranoid n adopting the strategy of "prudent man prepares!" rather than to allow optimism fill the air resulting in complacency. I slowly, slowly, and slowly claw back cash from the stock market. It took me about 7 years to take back 100% of my capital plus some profit off the table as war chest. No gut feeling. LOL! That was the past! Now not only ur gut, ur stomach, ur whole body all have double the sensors! Wisdom in life prevail over hardwork and effort? Even if u do not have, just find a close n trusted elder u truly respect n learn from him. I am lucky to find one, maybe? U r left with ur family, ur loving house, ur love in cooking (?) and many other more beautiful things in life than the war chest, which should be the least priority for u now! And of course at least better health now. Thank you, Rolf, your post is great food for thought. Gut feeling or intuition is just another heuristic of our brain honed—over millions of years—to ease the cognitive load of making a decision. It might be good at judging people. But it is not always good in domains where we have not gathered ample experience yet. For me that is investing. This post is inspired from ur earlier post on "our second brain." Ha, you got me there for a moment. My heart dropped when I thought to myself, how does Rolf know about my second wife? Just kidding. My second wife is the same as my first wife. Well, for investing I still count experience in years. Merely spending hours studying the stock markets is not enough. One has at least to experience some full bull-to-bear-cycle as well as a low-to-high-and-back-interest--rates. Wouldn't you agree? haha... ooops dun divulge ur secret openly! Hmm.. I refering to experiences in general. For eg, F1 driver vs 40 yrs driving taxi? For stock market, it should be both hours and years as I agree with u. Hours of reading and years to go thru the cycles! Why the 10,000 hours rules does not apply to investing. Of course that is just one perspective. Thanks. It's a great article and makes lots of sense. I agree to this perspective. Sports n investing are two different thing completely. To add, mind/behaviorial management or even life experiences do play important part in investing also.